Extang Revolution Bed Cover: Improve gas mileage by up to 10%, protect your cargo, and look good doing it! Instant Fastening, No Snaps, No Velcro. 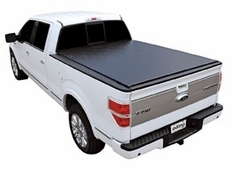 The Extang Revolution Tonneau Cover is the perfect solution for your truck. 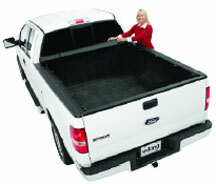 This ultra-low profile tonneau requires no tools, NO DRILLING, and no automotive knowledge to install! The The Extang Revolution Tonneau Cover is made from the highest quality materials and is backed by a lifetime warranty on both the frame and the tarp. The Extang Revolution bed cover easily rolls out of the way, to allow ease of loading or quick convenient access to cargo. You also can drop the tailgate with the cover completely closed. The Extang Revolution Tonneau Cover is designed specifically to fit your trucks make and model for a superior fit! Trucks with spray on and under rail bed liners have nothing to worry about either! The Extang Revolution still fits perfectly! You�ll be saving gas thanks to your improved aerodynamics, which will help this cover to pay for itself over time, and you�ll look good doing it! This item is built specifically for this model of vehicle to ensure a perfect fitment! The part number for this item is Extang 54425 and it fits 2009-2018 Dodge Ram 5'7" Bed w/out RamBox models. The Extang Revolution Tonneau Cover installs with no tools, do drilling, and no automotive experience required! You can do this installation yourself with the help of the simple, easy to read instructions that include pictures. Instructions including photos are included with the item when purchased. 1. The Extang Revolution Truck Bed Cover comes with everything you need. Note any damaged or missing components before installing. Double check your part number to make sure you have the correct cover. 2. Wash truck bed before installing your Extang Revolution Tonneau Cover. 3. Locate the two tracks and remove the paper strips, protecting their foam. 4. Install rails under the truck bed lips. The spring assist will point towards the front of the truck. With rail positioned, locate the predrilled holes on the rail for U-Clamps and Adjusting Clamps. 5. Use the most outboard position that the clamp will fit. Push rail downward and outward and tighten bolts with Allen wrench provided. Be careful not to overtighten. Rear clamp is adjustable to keep tail end of side rail square to bed. Use shortest bolt that engages sidewall. Push rail downward and outward and tighten bolts with Allen wrench provided. Repeat on other side. 6. Place tonneau assembly in the cab end of truck bed, then tilt the front up so you can slide it back and down into the tracks. 7. Slide the slide block outward so that it engages the wide flange of the side rail. Secure the knurled knobs to tighten. IF NEEDED, PUSH DOWN ON CAB RAIL TO MOVE SLIDE. 8. Unroll your tarp from the cab rail to the tailgate. The tonneau bows are deployed as the tarp is unrolled. Be sure that the bow-ends engage the bow catchers attached to the side rails. It may be necessary to loosen a bow catcher and slide it to engage the bow-end when the rear rail is locked. The bow catchers can be adjusted using the Allen wrench provided. 9. Insert tail rail into the tailgate block and rotate it down to the spring lever. Tarp is self-tensioning Keep tension on the tarp to be sure that last bow stays connected to the catcher when you push the cover down and into it. Your installation is now complete. Enjoy your new Extang Revolution Tonneau Cover and thank you for shopping at New Level Motor Sports! We Guarantee the lowest out the door price on Extang Bed Covers. If you find the same Extang part number for sale somewhere else for a lower out the door price, we will match or beat the price. Keep in mind that our shipping is free when comparing prices (Extang covers come in a very large box that is expensive to ship!). Simply give us a call at 866-639-5385 during regular business hours and direct us to where we can see the better price. We think our prices on Our Extang Truck Bed Covers are very competitive, but if you think you've found a better deal, we want to know!